BELLIN -Grundriss von der Bay Chedabuctu heutiges Tages Havre de Milfort . . . N°14. BELLIN, J.N. / ARKSTEE & MERKUS. - Grundriss von der Bay Chedabuctu heutiges Tages Havre de Milfort . . . N°14. Grundriss von der Bay Chedabuctu heutiges Tages Havre de Milfort . . . N°14. - BELLIN, J.N. / ARKSTEE & MERKUS. Title : Grundriss von der Bay Chedabuctu heutiges Tages Havre de Milfort . . . N°14.. Size : 7.9 x 11.0 inches. / 20.0 x 28.0 cm. Description :An important early map of the Milfort Harbour. This attractive map shows the Bay of Chedabouctou on Nova Scotia's eastern coast close to the Canceau Passage between Nova Scotia (Accadia) and (Isle Royale). 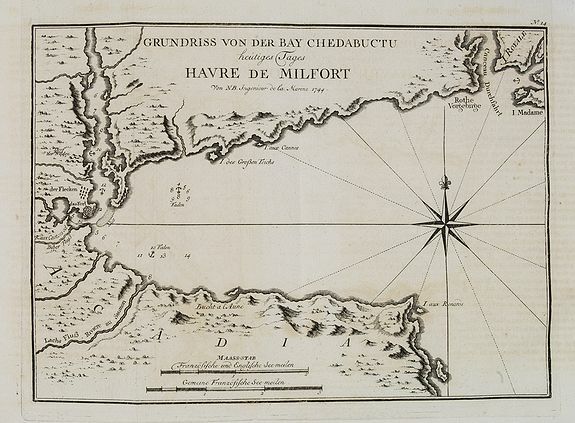 Chedabouctou was also named Milfort Harbor. Harbor contours are clearly defined and show a town (Le Bourg) a Fort, anchorages, the River de Saumons, Ance a l'Anne, Cap Rouge and I.Madam. Compass rose with decorative fleur-de-lys is situated in the Bay area.